Upper pitches of Murchison Falls. 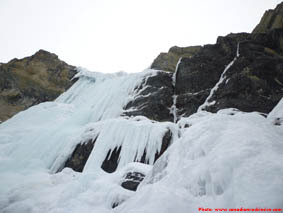 The short icy crack to the right of the main flow has also been climbed at about M5. Route Description: A great route with awesome views! It usually makes for a long day out in the mountains, although it has been soloed in just over 3 hours round trip from the road. Climb a short WI2 pitch and some snow to the start of the route proper. The line taken from here will depend upon what is dry and where protected belays can be found. 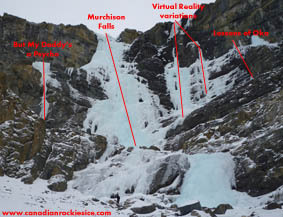 Most lines are about WI4, with the last or second last pitch being the hardest. A WI5+ finish can also be climbed on the left. At the top, there is a bolted belay on a ledge out right (one of the bolts could use replacing). Murchison Falls and some of the harder routes around it, including But My Daddy’s a Psycho. Virtual Reality (WI6, unformed) and Lessons of Oka. Gear: Screws. Two ropes recommended for the descent. 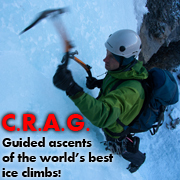 Objective Hazards: During times of high hazard there is some avalanche hazard on the final part of the approach, but none from above the route. The wind often forms overhanging snow & ice features on top which can collapse, particularly on sunny days.